Do you know what makes a successful content marketing program? If you’ve been following along with my ongoing series, the answer should be “yes” — which already makes you better off than half of all UK marketers. Now here’s the real test: what does your content marketing strategy look like? If your answer is a shoulder shrug and a noncommittal “I dunno,” you’re in the same boat as 63% of UK marketers who don’t yet have a documented strategy. That’s precisely why I’m bringing you this list of 10 Content Marketing Strategy Templates. As you read through this list, keep an eye out for elements that you can adopt into your own content marketing strategy. Not everything listed here will fit your business exactly, but you should be able to pull out some great, actionable examples that you can use to create your own perfect strategy. HubSpot and Smart Insights have come together to create something beautiful here. From basic concepts to more in-depth SWOT analyses, KPI objectives, content-mapping, and comprehensive timelines, this Excel document based template has something for every business—even if it is gated. What I love: Lots of big, beautiful examples and fillable forms that you can emulate your content marketing strategy on. It also includes my favourite Template — the Content Matrix — which is a great way to visually map your content ideas and what audience they’re meant to reach. What it’s missing: Honestly, not much. This template is very inviting and intuitive, but I can understand if you get scared off by the lead capture form (which has more than 10 questions) that you’re required to fill out before you can download this guide. Moz is nothing if not thorough, so it should come as no surprise that their Content Strategy Template is five chapters long and chock-full of useful advice. It’s ungated and available for download as a 17-page Word document. What I love: Moz always gives you your money’s worth—especially in this case, because the template is completely free. This only does this huge doc walk you through content creation, it also explores branding, goal creation, backgrounds research, and useful tools. What it’s missing: Despite the huge amount of best-practice advice here, this download doesn’t actually include a blank template that you can adopt as your own content marketing strategy. That said, they easily give you the know-how you need to create your own. This template first surfaced a few years back, and it’s still one of my favourites. This fetching web-based template by Amrita Chandra is ungated, which makes it an invaluable resource for new B2B businesses. 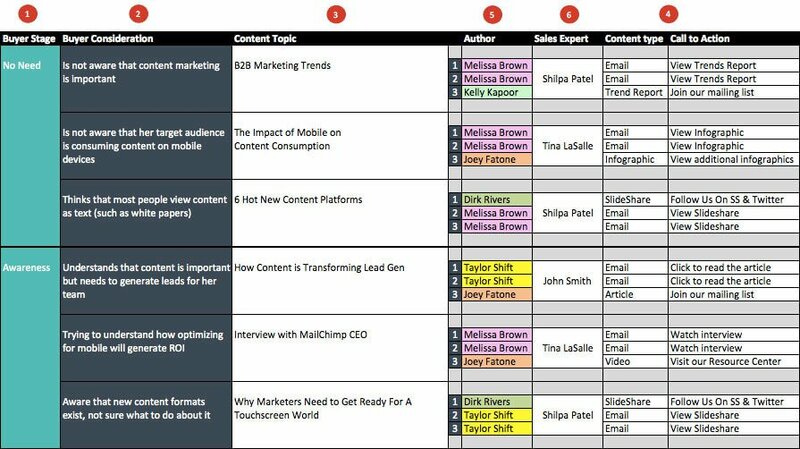 What I love: This template fits really well with my article on matching content to the buyer’s journey. You can match content to buyer stages, assign unique authors, and list topics and pain points for your authors to collaborate on. What it’s missing: To make full use of this template, you’ll need supplementary content, such as content audits and buyer personas. 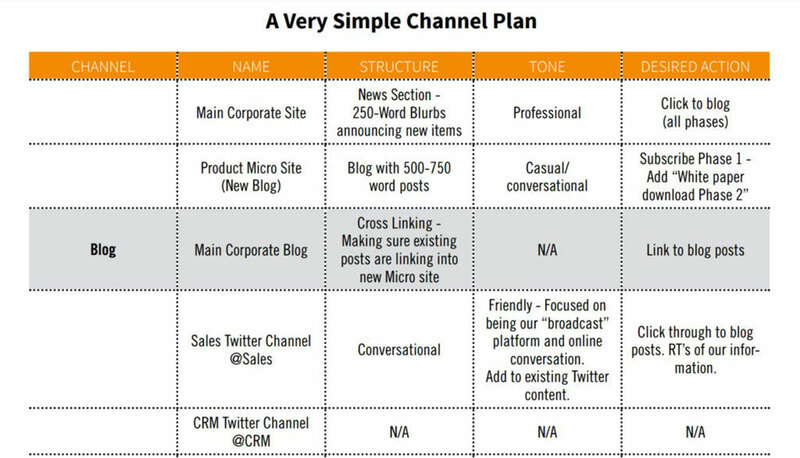 While a great organizational tool, this template alone isn’t enough. The CMI produces some amazing content, such as the annual content marketing reports I’m so fond of citing. Though this guide is gated, it doesn’t ask for a lot of information before letting you download a huge PDF guide of useful tips and How-To’s. What I love: There’s lots of value here and it’s laid out with plenty of visuals to help you arrive at your own content marketing strategy. This guide also breaks its advice down into 36 essential questions that will help you arrive at a better understanding of your audience and your content offerings. What it’s missing: Between gated access and another huge document (16 pages), it’s easy to feel overwhelmed by the scope of these “essentials” and to be scared away from ever starting your Content Marketing Strategy. But, if you can overcome that hesitation, there’s great value to be had here. 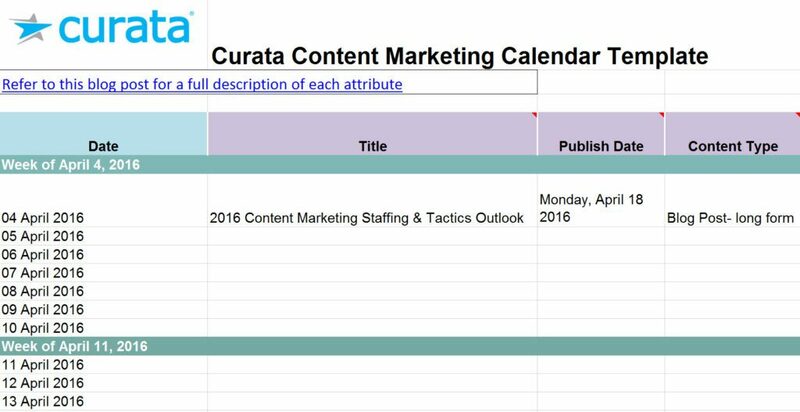 Another gated offering, Curata’s Excel-based editorial calendar is clean and simple. They guide you gently through their “12 Must-Have Fields,” which you can use to build your strategy, plan out production, promote, and measure your content. What I love: Curata doesn’t leave you hanging. This calendar offers is designed to be easily navigable, support metadata collection, and it even suggests meta tags that you can use for each step. What it’s missing: While there’s something to be said for the simple elegance of this editorial calendar, it does feel a little sparse when compared to some of the earlier offerings. I love the “and tutorial” part of this offering just as much as the editorial calendar itself. Not only do you get a great calendar that you can fill in to fit your business, but you also get a long instructional post and a 20-minute podcast to boot. This Excel-based download is gated, but all it needs from you is your name and email address. Easy! What I love: The calendar template is clean and simple, with everything organized by week and month. You can also include images and embed other content (such as graphics) in the template, for easy access come publishing time. Part of Neil Patel and Kathryn Aragon’s Advanced Content Marketing Guide, these templates are ungated and available both online and as PDF downloads. This rich guide bundles tons of examples, beautiful infographics, and plenty of useful tips into one neat package. What I love: Very few guides give templates for audio and video content on top of your more traditional eBooks and blogs, but this guide does. You’ll also find templates for interviews, reviews, and case studies—which few other How-To’s tackle. What it’s missing: This guide is a little more jargon-riddled than most, which might be unwelcome to SMEs who just want to wet their toes in the content marketing scene without learning a whole new language. Buffer isn’t messing around. They’re ready to give you a huge, ungated Word Document guide, complete with tons of tips and examples. With a total of 21 steps, this template takes you through everything from persona creation to executive summaries. What I love: This is the only template on the internet that offers you multiple ways to absorb the information, including a slideshare presentation, a blog post, and a download. There’s a lot of content to sink your teeth into—for both marketers and agents alike. What it’s missing: If you thought Moz and CMI had big offerings, this guide is a monster. This 30-page download isn’t for the faint of heart, and while it is very thorough, I do find myself wondering if it isn’t a little more than we need. Convince and Convert’s editorial calendar is nice and simple, but it’s a little dated (with no new version forthcoming since 2014). That said, this ungated Excel-based template is still more than serviceable and easy enough to repurpose for the current year. What I love: Convince and Convert reiterates what I’ve been preaching, that you can re-purpose your old content to make fill a calendar with months’ worth of material. This template is colour-coded for ease of use and allows you to see several months at a time. What it’s missing: While the calendar itself is great, the supplementary guide on building your content calendar feels underdeveloped. I love that the guide is only three steps, and when your final step is “schedule, publish, promote, track, and tweak your content,” it feels a little forced. The truth is, content marketing doesn’t fit into a neat little three-step program, and you’ll need to work hard to make your content shine. AXZM’s offering—built using Google Sheets—is actually a whole bunch of templates bundled together, including persona worksheets, content audit templates, and an editorial calendar. This content is gated however, and it requires you to “pay” for the template by endorsing it on social media. What I love: AXZM’s is one of the only strategy templates that includes a section specifically meant for inevitable website redesigns. This section, on 301 redirects, talks about how to handle content whose URLs disappear when pages are moved, deleted, or renamed. What it’s missing: This web-based template is organized in such a way that it’s not always easy to download and work offline with. I’m also not a fan of any content that forces me to promote it before I can even take it for a spin—so “paying with a Tweet” left a sour taste in my mouth. The list above includes both editorial calendars and overarching content marketing strategies, because I’m painfully aware that there’s no such thing as a one-size-fits-all solution. You may find that some of these templates are incredibly useful, but others… not so much. You may even want to mix and match some of each of these templates together. And that’s excellent. Keep multiple writers spanning different departments on brand. Communicate to employers, business partners, and clients why content marketing is key to their success. Retain your existing customers and reach new ones. So which content marketing strategy do you gravitate towards? Have I missed any that you love? Let me know in the comments below! Note: This post is hugely indebted to and inspired by Victoria Taylo’s amazing article, 19 Free Templates to Save Time On Content Marketing, Jodi Harris’s Editorial Calendar Tips, Tools, and Templates and Mitchell Hall’s Content Marketing Editorial Calendar Templates: The Ultimate List. Check out these posts for even more great templates not listed here. The major problem in our company and in our team was that we were using several different tools and platforms to manage our work. While we were communicating through so many channels, emails and messages were getting lost, we were forgetting important dates, content was often late, and from time to time we were missing out on events and dates which are important for our industry. We’ve realized that not one calendar out there didn’t suit our needs, so we’ve decided to create our own. We’ve gathered the whole team there and now everything is in one place and our tasks and dates are clearly defined. So, it’s really important to know what your needs are and then decide which tool to use. Absolutely agree with Sandra – our internal strategy work is based on our own templates – all of which fit with ours or our client’s processes. They’re often unique to that particular project, too. That’s an excellent point, Sandra. You need to have your strategy pinned down before you can pick a template (or any tool for that matter). If you grab every free tool, but don’t understand how they fit into your plan, you’ll just bog down your process. I’m sure many companies will be in the same boat as you, and need to create their own calendar or content strategy template that’s either something wholly new or a Frankenstein-ian mashup of a number of other models. I am glad your team arrived at a working solution, though! I think you should mix them and create new one !